This is the card I've created for Lea Lawson's Layton's Legacy Card Drive. Please visit the link to find out more about this very worthy cause and fundraiser, which will provide gift cards for parents whose children are in the NICU at Minnesota Masonic Children's Hospital. To find out more about Lea's son Layton's story and the fundraiser click here. cardstocks for the background layers. I cut those using Gina K's Small Double-stitched Rectangle dies and Avery Elle's Double-Pierced Rectangle Dies. 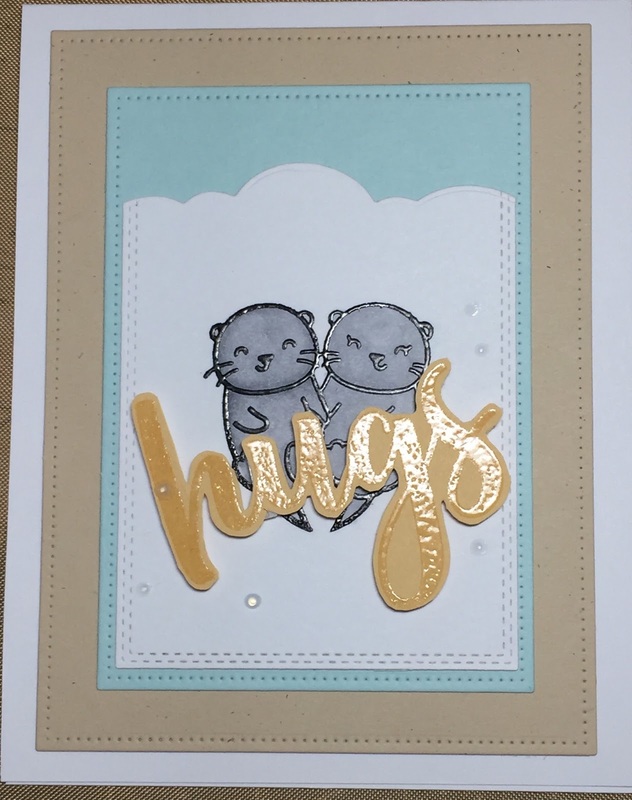 The clouds behind the cute little otters were made using Honey Bee's Ocean Border Die. The sentiment is also from Honey Bee but since I didn't have the die, I stamped the sentiment on mustard yellow card stock using Versamark ink, heat embossed with clear embossing powder, and fussy cut the whole thing before adhering it using narrow Darice Adhesive Foam Strips for dimension. 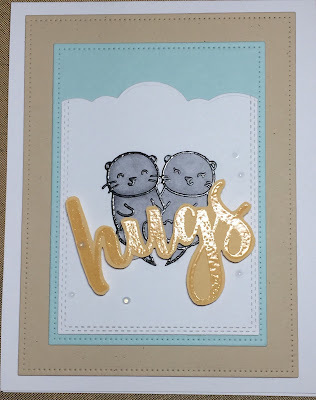 I colored the snuggly otters using Copic markers in shades of gray. To finish things off, I added a few Tonic Morning Dew Nuvo Crystal Drops. The white paper and actual card are 80# Neenah Classic Crest.